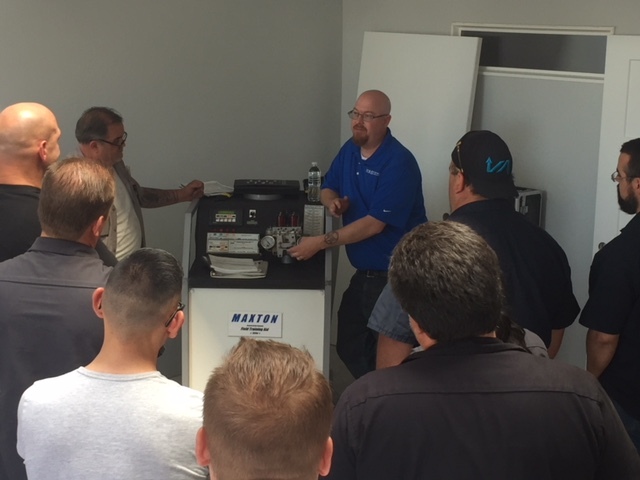 Minden, NV- On April 27, 2018 Maxton provided hydraulic elevator control valve training for 11 mechanics at The Elevator Company in Rancho Cucamonga, CA. This continuing education class delivered (4.0 credit hours) to each elevator mechanic through the NAEC’s approved Certified Elevator Technician (CET) program. These sessions are made up of classroom instruction on product knowledge, identifying and resolving common hydraulic field issues followed by practical hands on application through valve adjustment and troubleshooting using the Maxton TA4M training unit. Maxton elevator control valve training classes are all about building efficient, competent, productive elevator mechanics that bring more value to your customers all while padding your bottom line. “Thanks again to Aaron and Karlyn Semler for having us and seeing the value this class has for the success of their mechanics and business. It was gratifying to see the aha moments during the hands-on portion of the training,” said Landon Smallwood, Technical Support / Trainer.